Friends of Jimmy Hall, above, owner of Hawaii Shark Encounters, talked yesterday about the expedition in Baffin Island, Canada, in which he died. 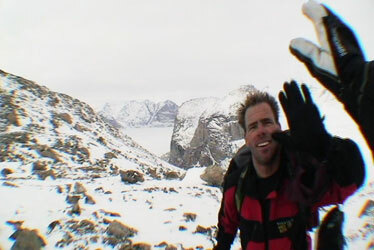 Hall is shown high-fiving a pal during that trek. Even though it was about 8 p.m., it was still light on Canada's Baffin Island north of the Arctic Circle on May 9. Hawaii thrill-seeker Jimmy Hall and others in his expedition were doing their second BASE jump of the day from atop a 3,000-foot cliff. Two of his companions landed safely, but Hall did not. Yesterday, his friends and fellow adventurers spoke to the press at the Halekulani Hotel about Hall and his fatal fall. BASE stands for "building, antenna, span (bridge) and earth (cliff)" -- platforms for this particular kind of parachute jumping. Sam Ford Fjord on Baffin Island and Angel Falls in Venezuela are considered the ultimate destinations for BASE jumpers. Matt Gerdes was at the top of a different cliff and watched Hall and two others in the expedition jump from across a narrow canyon. Hall was the third jumper off the cliff so he could record video and still pictures of his compatriots with his helmet cameras. All the jumpers were wearing wing-suits, which have extra material between their legs and below their arms to allow them to glide or "fly" rather than free-fall. Jimmy Hall, owner of Hawaii Shark Encounters on the North Shore, is shown here on a trek in Baffin Island, Canada. 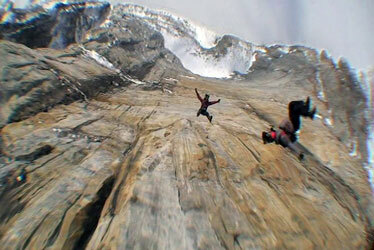 On May 9, Hall died after "BASE jumping" from a cliff for a documentary. Gerdes said the two jumpers glided outside the canyon to their intended landing zone on the sea ice. But Hall started his glide a little later than the other two jumpers, he said. "A few seconds into the jump, he ended up too low into the canyon to have a safe deployment and was forced to fly toward the middle of the canyon to gain a little bit more altitude in order to try and deploy his parachute safely," Gerdes said. Hall did deploy his parachute, but he was less than 100 feet above the canyon floor, and his parachute did not open fully, Gerdes said. When Hall hit the canyon floor, Gerdes saw a puff of snow kick up. "So I prayed a little bit, ran up to the exit point where I could jump from safely, and did that and met everyone at the bottom," Gerdes said. Hall is seen here in the center of both images, which were taken from video. 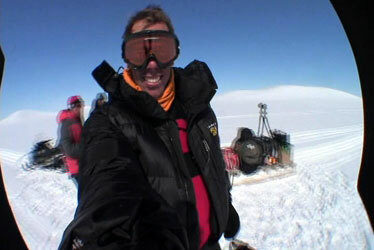 Other members of the expedition who were on the ground reached Hall within a minute but determined he died on impact. After hitting the canyon floor, Hall slid about 1,500 feet to the edge of the sea ice, Gerdes said. His girlfriend and partner, Stefanie Brendl, talked to Hall the day before by satellite telephone, and she said the group sounded like a bunch of kids on a fun outing. "I hung up really, really happy for him because he was doing exactly what he wanted to do with the people he wanted to do it with," she said. Hall owned Hawaii Shark Encounters on the North Shore and drew national attention in December 2005 when he was recorded on videotape swimming with and touching an 18- to 20-foot great white shark off Haleiwa. The Discovery Channel had recently selected Hall to host its "Shark Week" television program. His agent Micah Johnson said video from the Baffin Island expedition will be made into a production as Hall had intended. Members of the expedition in which thrill-seeker Jimmy Hall was killed doing a BASE jump recounted the expedition yesterday during a news conference at the Halekulani Hotel. Hall's girlfriend, Stefanie Brendl, left, also gave her insights. Matt Gerdes, right, described what he knew about the accident. 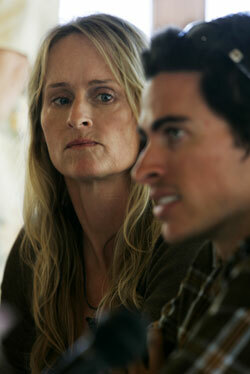 Brendl was not on the expedition, but she talked to Hall the day before he died.